I took me about three days to make the rainbow ice cream cake because of the freezing times for the ice cream. But apart from that an ice cream cake with natural food colorings is really easy to make. Below you’ll find the natural food dyes which I used for the naturally colored rainbow ice cream cake. Use your favorite white ice cream base and add the natural food dyes till you like the color. Vanilla ice cream or yogurt ice cream work well as ice cream bases. Blue Food Coloring: The blue ice cream is colored with my homemade blue food coloring (made with red cabbage and baking soda). Don’t fear, the ice cream doesn’t taste like red cabbage! 😉 Gradually add homemade blue food coloring to a white ice cream base (I used vanilla ice cream) till you like the color. Purple Food Coloring: Natural blue food coloring with red cabbage is ph-sensitive, so you can turn the blue ice cream into purple ice cream with acid, such as fresh orange juice. Gradually add some fresh orange juice till the blue ice cream turns lavender. 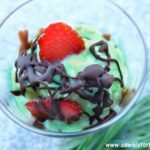 Green Food Coloring: The green ice cream is based on this Victorian green custard and is colored with spinach. And no, the ice cream doesn’t taste like spinach either. 😉 It tastes fresh with a lemon flavor. To make green food coloring, blend fresh spinach. Use spinach puree or strain the pureed spinach through a sieve to extract spinach juice. Yellow Food Coloring: Blend a fresh ripe mango or 1 can of peaches. Here you’ll find my recipe for vegan mango coconut ice cream. Orange Food Coloring: The orange ice cream is mandarin orange ice cream, colored with raw carrot juice. To make orange food coloring, grate one or two carrots and strain through a sieve. Red Food Coloring: For the red food coloring, I pureed raspberries and strained them through a sieve to remove the seeds. Ruby Food Coloring: The deep ruby ice cream is colored with pureed blackberries. Puree blackberries and strain them through a sieve to remove the seeds. 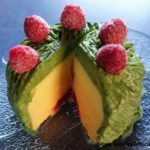 Black Food Coloring: I haven’t used it for the rainbow ice cream cake, but if you want you can make black food coloring with black sesame seeds: Vegan black sesame ice cream recipe. Because it takes some time to make a rainbow ice cream cake, make it some days before you plan to serve it. Make your ice cream base and color it with natural purple food coloring. Freeze the purple ice cream in an ice cream maker. As soon as the ice cream is frozen, spread it evenly into an ice cream container. Put the container into the freezer. Now prepare the natural blue ice cream and freeze in an ice cream maker. As soon as the blue ice cream is frozen, spread it on top of the purple ice cream. Put the container back into the freezer, till your green ice cream is ready. Continue till all natural rainbow ice cream layers are in the container. Then put the naturally colored rainbow ice cream cake back in the freezer until you’re ready to serve. 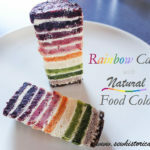 You can also use homemade natural food dyes to make rainbow cake. Beautiful cake and I love the use of natural coloring! Thanks for sharing on the What’s for Dinner link up! This is so pretty! What a fun recipe to make with kids this summer. 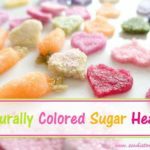 Thanks for the awesome natural food coloring ideas. Love! You’re very talented at finding just the right color with natural ingredients. The Rainbow ice cream cake looks great. Thanks for sharing at Snickerdoodle. Pinning. This is fantastic. I have a severe allergy to food colouring where I need an epipen . I wasn’t able to eat any types of icecream for 30 years, now there are a few brands I can try, but certainly none that are pretty like this one is. Pinning and thank you so much. Wow! This is really gorgeous! Thanks for sharing with SYC. love this! any idea on how I can make a naturally red colored ice cream that doesn’t taste like raspberry? Thanks, Bobbi! 🙂 You could try beetroot – I often use beetroot as natural pink/ red food dye.